For those looking forward to savor the vibrant colors of life amidst stark desert of Rajasthan, Jodhpur is an apt destination. Situated on the edge of Thar Desert, Jodhpur is the second largest city of Rajasthan after Jaipur. The city is also known as the Blue city due to the blue-painted houses around Mehrangarh Fort. Jodhpur was founded by Rao Jodha, the leader of the Rathore clan, in 1459 AD. The city was built to serve as the new capital of Rathore kingdom, Known as Marwar. Owing to its strategic location near road linking Delhi - Gujarat trade route, the city thrived from the trade in copper, silk, sandals, date palms and coffee. Perched on a 150 meter high hill, Mehrangarh fort is one of the largest forts in Rajasthan. The fort was founded as the site of Rao Jodha’s new capital in 1459 AD. The massive fort complex has many palaces and temples which include Moti Mahal, Sheesh Mahal, Phool Mahal, Zenana Deodi and Chamunda Mataji Temple. A museum in the fort houses an exquisite collection of howdahs, palanquins, fine arts, music instruments, and weapons and is well worth your time. Located 1 kilometer downhill from Mehrangarh fort, Jaswant Thada is a striking white marble cenotaph of Maharaja Jaswant Singh II. Jaswant Thada, fondly called the Taj Mahal of Marwar was built by Maharaja Sardar Singh to commemorate his father Maharaja Jaswant Singh II. The main cenotaph was given a shape of temple with intricately carved marble stone. Umaid Bhawan Palace was built by Maharaja Umaid Singh and is one of the largest private residences in the world. The palace is also known as Chittar Palace due to the extensive use of Chittar sandstone and its location on Chittar hill. At present, the palace is divided into three functional parts- a luxury five-star hotel, a museum and residence of the royal family. Cultural festivals in Jodhpur are another major attraction for travelers. These festivals offer an insight into the culture and traditions of Rajasthan. The most popular festival in Jodhpur is the Marwar festival which is held every year to commemorate valiant heroes of Rajasthan. Originally known as the Maand festival, this festival showcases the chivalrous life of the erstwhile rulers. Another important platform for cultural exchange is the Rajasthan International Folk Festival, an annual fest held in Mehrangarh fort. The festival provides an open platform to the folk artists and musicians from around the world with more than 250 participants showcasing their talent. Jodhpur is renowned for its impeccable hospitality and this tradition is followed even now. Jodhpur hotels provide comfortable stay to their guests. An array of hotels in Jodhpur is available to cater to individual taste and preferences and fit all price brackets. Accommodation variety includes heritage hotels, luxury hotels, budget hotels and camp and tent stays. One of the must do things while you are in Jodhpur is a camel-back safari in the Thar desert. 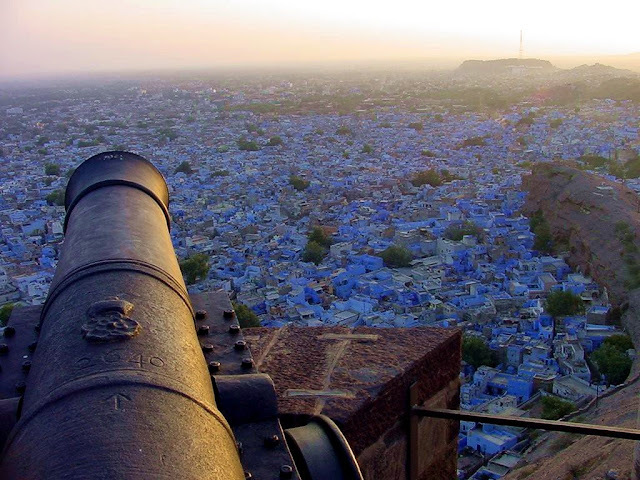 Jodhpur is often referred to as the gateway to Thar. A safari in the undulating sand dunes of the desert with a camping session in night to behold the morning glory of sunrise is always on prescription in Jodhpur. Savor the mystical experience as you behold the golden hue of the sand during sunrise. Apart from local sightseeing in Jodhpur, shopping for souvenirs forms an interesting part of your trip. Bandhej, Mojris, Jodhpur breeches, antique items, furniture and handicrafts are some of the popular souvenirs for which you can shop in the colorful Sardar market near the famous landmark of the city, Clock Tower.